WordsAhead is a labor of love, based on two decades of independent critical thinking, problem-solving, joyful creativity, tedious typing and vetting many sound-based products… all motivated by a hope that unknown words-to-be-read might be taught ahead of time. The goal is precise pronunciation and spelling. Later, word meanings can be sleuthed within the context of the author’s message via shared inquiry, allowing divergent perspectives. WordsAhead requires your valuable time and focused energy, but not your money. Most books in our database can be borrowed from a public library. Popular children’s poems and stories are parsed to the smallest sound-unit, all to be taught ahead-of-time via *CloudSpelling*. Vibrant Learning Affiliates was a nonprofit 501-c-3 corporation founded June 17, 1996 and retired in 2011 by Judy Ramirez due to lack of public support. Learn more at GuideStar. WordsAhead remains a noncommercial public service outreach. 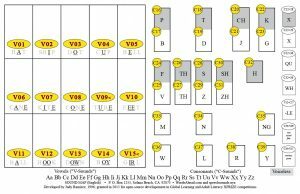 Notice: Speech sound-units were first simply labeled #1-#39; then names were improved to V01-V15 (Vowels) and C16-C39 (Consonants). All vocabulary lists indicate relative linguistic complexity of both syllables (ie. cV, cVc, cVcc, ccVcc, multi-syllable, etc.) and the whole poem/story (unique decodability rankings which contradict Lexile rankings).